2-Way electric ball valves for oils and fuels. 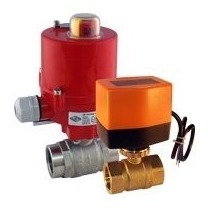 These valves operate from zero bar and are suitable for both flow directions. They open and close in several seconds (solenoid valves open immediately), are reliable and have a low energy consumption. Electric ball valves are available in several voltages. Moreover, there are different ways of electrical control possible, such as 2-point (on-off control, with internal relay), or 3-point. Note that electric ball valves need electric power for both opening and closing.